Double-crested cormorants consume large amounts of fish like the round goby and yellow perch. Photo: Peter Wallack. The double-crested cormorant is eating more round gobies and fewer sport fish, a recent study says. From 2003 to 2007, researchers estimate that the cormorant ate 13 million fewer yellow perch and 600,000 fewer smallmouth bass in two large Lake Ontario cormorant colonies. The black waterbird bird mostly ate the invasive round goby instead – more than 70 million of them throughout the study. Researchers analyzed more than 10,000 regurgitated cormorant pellets, that contain undigested stuff like fish bones, on Pigeon and Snake islands, according to research published in the Journal of Great Lakes Research. Those islands – both in Canadian waters of Lake Ontario – have the second and third largest cormorant colonies in the lake’s eastern basin. To get an idea of how cormorant diets changed after the goby invasion, researchers examined cormorant pellets from 1999 to 2007, covering the “pre-goby years” before 2002 and “post-goby years” up to 2007. After the cormorant started eating gobies, the invasive fish made up about three-quarters of the birds’ diet in each colony. Before this shift the cormorant mainly ate sport fish like the yellow perch and the smallmouth bass, a diet that’s aggravated sport fishermen. At Snake Island from 1999 to 2002, yellow perch were the cormorant’s major prey, almost 40 percent of its diet. In post-goby years perch were about 11 percent of its diet, the study says. The researchers measured the makeup of the cormorant diet by counting the number of fish the birds ate rather than measuring the fish weight or biomass. This is significant because sport fish like yellow perch usually are larger than the goby. If the researchers had measured by weight or biomass, sport fish would make up a larger percent of the diet. “Because gobies may be smaller, it may not be as dramatic as the numbers might appear. But, there’s no doubt about it. There’s a lot fewer yellow perch being consumed,” said James H. Johnson, one of the study’s authors. Johnson is an ecologist and eastern branch chief of the U.S. Geological Survey Great Lakes Science Center. And this observed diet shift isn’t unique to these colonies. “Round gobies have now become the number one diet component in the eastern basin,” said Steve LaPan, Lake Ontario fisheries unit leader of the New York Department of Environmental Conservation. Other studies show a similar diet shift in New York waters. And that’s potentially good news for sport fish populations. “If you just look at yellow perch, they’re clearly reducing the predation pressures on fishes that were of concern to folks,” Johnson said. This shift to the goby is no surprise. The cormorant is a highly opportunistic predator. “Whatever is most abundant, they will take advantage of that,” LaPan said. 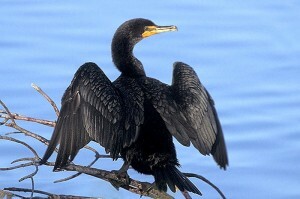 Cormorants eat so many sport fish that the bird is now a nuisance to fishermen. Such a nuisance, that many states now control the bird’s population through shooting and egg oiling. “The general sentiment among fisherman toward the cormorant population is pretty negative,” said Chad Lapa, who’s been fishing on Lake Ontario for 28 years and owns Lake Ontario United, a website dedicated to fishing and other sports. 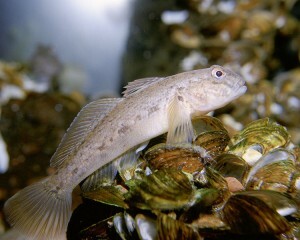 The round goby, an invasive bottom feeder, has become the main dish for cormorants. Photo: Eric Engbretson. But the goby isn’t a dream date either. “As soon as your bait would hit the bottom it would be chomped by these gobies,” Lapa said. Gobies gobble up fish eggs effecting fish populations like the smallmouth bass. The cormorant’s new eating regime and its new fish du jour may alleviate some pressure on sport fish, revealing a potential positive in the arrival of this invasive species. When an invasive species enters a new environment, its population skyrockets before it uses up available resources and crashes. The sampling done during Johnson’s study probably occurred before this typical crash, so more gobies were available for cormorants to eat. If goby populations decline the birds could switch back to sport fish. “Its certainly plausible that the cormorants could go back,” LaPan said. There is evidence of a goby population decline in New York waters over the past two years. But since the invader is still new to the area, predicting what it will do in the future is difficult. “It’s kind of hard to say what will happen because it’s a newer species,” said Maureen Walsh, a research fishery biologist of the U.S.G.S. Great Lakes Science Center. But if gobies are around, the adept cormorants will probably make them a meal. “The gobies are going to be a permanent item in the diet, in cormorant diets. They found them, they’re going to be continually utilizing them,” Johnson said. But the cormorant and the round goby both hurt sport fish populations and fishermen like Lapa have difficulties finding the positives in either. I have not tried other fish bones yet. I think that the results are startling, and I have tried all baits more than once. The occasionally caught minnow or crayfish was released back into the water, but there were none caught when using the sardines. Years ago, I recall fishing in Tawas Bay when perch were plentiful. In recent years, perch have been virtually non-existant, although there are anecdotal reports that perch are returning. Interestingly, there have been relatively few cormorants in the Tawas Bay area, so there are clearly other factors affecting perch populations. We can’t blame cormorants for every population decline! Heading out of Collins Bay to the Brother Islands(3 in number) the cormorants have completely cleaned off all vegetation from the trees and the smell is terrible.Snake Island is the same as so is many other small islands in this area. Years ago it was so nice to drop anchor by one of these islands and either have lunch or to enjoy the peace and quiet, but now that is impossible due to the noise and smell of these birds as well as the impact they have on the fishing community. Something should be done to protect the once beauitful islands in the basin area! Interestingly, that before cormorants reappeared in the Les Cheneaux Islands area of the eastern Upper Peninsula of MI there existed a thriving sport fishery for yellow perch. Then in the 1980’s-90’s with the resurgence of cormorants feeding on the perch during spring and early summer, the fishery crashed. This led to economic hardship among the businesses that catered to the anglers who, with the exception of locals, failed to visit the area. Then, after an intensive program of killing adult birds and oiling eggs on nesting islands reduced the number of cormorants, the perch population slowly increased back to an attractive sport fishery. Much the same situation is taking place around other Lake Michigan islands that once had significant smallmouth bass populations and largely catch and release sport fisheries. Now they are defunct, likely due to predation by cormorants. One thing I learned as a Fisheries Biologist is, that life history studies done in large ecosystems often do not show exactly what is happening. However, also as an avid angler, I would give credence to anecdotal evidence of fishery declines and increases from angling success or lack thereof. The above author also failed to mention the destructive nature of large numbers of nesting cormorants on small island rookeries. Stabilizing plants are often destroyed, and other nesting birds are displaced. One of the strangest things about the double-crested cormorant is its apparent ability to generate irrational hatred in humans. The double-crested is one of 39 living (and one recently extinct) species belonging to a family of aquatic birds known by the tongue-torturing name, Phalacrocoracidae, more popularly called cormorants or shags. They are found on every continent and are related to pelicans and gannets. People think they know a great deal about the super-abundant double-crested cormorant, the only species to nest in Ontario. But much of what they know is myth. Along with many other species of fish-eating wildlife, cormorants are a scapegoat fishermen love to blame for any real or imagined depletion of fish stocks. I have challenged everyone who hates cormorants to name one naturally occurring fish stock, anywhere in the world that has been wiped out by any cormorant species, anywhere, any time. None have. Double-crested cormorants do eat fish, to the tune of about one pound per day per adult bird, and obviously are a factor in fish population numbers. But study after study has demonstrated double-crested cormorants do not seriously affect fish stocks. They mostly eat species of fish of no commercial value and not favoured by sporting anglers. They also do not take fish that feed “desirable” game and commercial fish species except in highly contrived circumstances (for example, on a fish farm, or in a small bay or behind a dam). Cormorants certainly can cause temporary shortages of fish at the local level, but any more than that, and the cormorants, themselves, would die. They don’t have alternative food sources. They eat so few commercial fish compared to their population it usually makes little or no statistical difference to the numbers of fish available to anglers. As one study put it, “…no study reviewed convincingly demonstrated double-crested cormorants’ negative impact (on) sport or commercial fisheries.” There are collapses in once robust fisheries reported from around the world, whether cormorants of any kind are present or not, but it is a large suite of factors that have caused those fishery collapses, and primary among them is overfishing by humans. Still, a lot of fishermen hate the highly visible cormorants. Unlike factors that have truly profound impacts on population sizes of any given species of fish-from zebra mussels to changes in water temperature to introduced non-native salmon species with voracious appetites for native fish. And, here in Ontario, they are seen as a new creature in our midst. Fishermen remembering (accurately or otherwise) lots of big fish from a childhood in which cormorants were rare or absent, now worry that there are fewer fish. Cormorants are now common and increasingly apparent. This begs the question-steeped in the most basic laws of physics-of how a species, dependent on a finite food supply, can exponentially increase, while its food decreases; the belief is that the double-crested cormorant is a recent invader and our native fish have not evolved defences against the marauder. But like so much that is believed about this bird, it simply is not true. Ironically, the double-crested cormorant is playing a positive role in terms of protecting native fish stocks, feeding on invasive fish species whose presence is deleterious to human interests. One of the most frustrated scientists I’ve ever chatted with is Linda R. Wires, of the University of Minnesota. She has studied cormorants for years, authored many peer-reviewed papers, and cannot understand how both the general public and wildlife managers manage to ignore the facts science produces. She spoke to me as she and a colleague were preparing a paper on the history of the double-crested cormorant in the Great Lakes region. It is an endemic North American bird (with a small population in the West Indies) that has, within all recorded history, ranged from the extreme northwest of the continent to the east coast. It is inconceivable to think that it has, until recently, somehow avoided the largest fresh water system in the world-the Great Lakes and the complex and vast pattern of post glacial-lakes and rivers covering most of the province of Ontario. Linda Wires points out that, in 1886, the newly formed American Ornithologists Union began the compilation of bird species of North America in a frequently renewed annotated checklist, popularly known as the “AOU Checklist.” It is considered the definitive reference on bird distribution in North America, and is still published periodically as new information becomes available. That first edition, in 1886, gave the Great Lakes as part of the range of the double-crested cormorants. Then, as now, the AOU included the top ornithologists in the continent, and they clearly recognized the species as inhabiting the Great Lakes. So, too, did Philo Louis Hatch, M.D., (1823-1904) in his pioneering state bird book, Birds of Minnesota, published in 1892, and the Hamilton-based, noted pioneer Ontario ornithologist, Thomas McIlwraith (1824-1903) in our very first provincial bird book, Birds of Ontario in 1886. In my personal library, I found that The Natural History of the Toronto Region, Ontario, Canada, edited by J. H. Faull, Associated Professor of Botany, University of Toronto, 1913, and the noted Toronto-based ornithologist, J.H. Fleming, listed the double-crested cormorant as occurring in Toronto as rare migrant. I checked other old books I own. In Birds of America, whose Editor-in-Chief was T. Gilbert Pearson, 1917, (and still in print), we read under the species account of the double-crested cormorant, “Distribution-Eastern North America; breeds from Central Saskatchewan, southern Keewatin, northeastern Quebec and Newfoundland…” and also in the U.S. There are numerous other such early descriptions of the double-crested cormorant’s range, all including the Great Lakes, where they either nested, or visited during migration to and from the northern lakes. Here in Ontario, not too far from the North Channel-where locals consider the species invasive and the Ontario Ministry of Natural Resources is oiling eggs-the Ojibwa people, as reported in 1893, named a rock that is part of a cliff face, “Kakakeshiwishtagwaning”, which translates to “cormorant’s head.” They must have been familiar with cormorants. Jim Baillie also noted a report by fishermen (who, then as now, persecuted the species relentlessly) that cormorants nested in the general region of the Mink Islands, in Lake Huron, in 1919. While no actual verification, in the form of preserved specimens or photographs, was obtained (hardly a surprise), Baillie, who was extremely conservative about such matters, was inclined to believe the report was accurate. The double-crested cormorant was also noted by American ornithologists to be breeding in Agawa Bay of Lake Superior’s eastern shore in 1926, where the residents noted that “the cormorants had nested there for years.” This suggests they were there prior to the 1920s, although by then, egging and persecution by fishermen had done most of the damage to our Great Lakes population-damage that the application of DDT would virtually complete. (However, there is apparently no time in recorded history when double-crested cormorants were totally absent from the Great Lakes). Cormorants are generally considered inedible, so one does not expect to find cormorant bones in archeological digs of kitchen middens-bone piles from meat consumed by early people-but in fact they were found at a site Brent County, on the Niagara Peninsula, that dates back to the 16th century. The myth that the cormorant is alien to our waters seems to stem from the lack of preserved specimens of nests or newly hatched young. In the old days of ornithology, all sightings of bird species were considered, at best, “hypothetical” if they were not backed up by preserved specimens (later clearly identifiable photographs became acceptable). And by this criterion, although the double-crested cormorant was reliably recorded at the Lake of the Woods in the 1790s, it did not become “official” until 1924, when nests were formally collected and recorded on an island in Lake Nipigon. It is probable there are more cormorants in Ontario now, than ever before. No one can say for sure that there are, but if we go far back in time, we find that the conditions were probably less favourable for the kinds of fish cormorants eat, in the centuries following the retreat of the very ice age that left this province with its immense legacy of lakes, including the Great Lakes system. But they were here, and as colonial nesters, it is likely that there were large populations wherever suitable populations of fish existed. Nature, even when left alone, is not static. Add human activity, and there is a rapid dynamic that sees many changes in relatively short time spans. This is particularly true of such mobile species of wildlife as birds and fish. One would be hard put to find a species of bird that exists in Ontario now, in essentially the same numbers and in the same locations, as it did one, two, three or nine hundred years ago. The landscape has changed, and so has the mix of flora and fauna that share our space. Humans have either accidentally or intentionally been responsible for the introduction of hundreds of species of plants and animals that would otherwise be absent from Ontario. And species like the northern cardinal, once unknown in Ontario, have moved north in response to warmer winters and the increased availability of food, thanks to humans. But the double-crested cormorant has been here all along. Like the wolf, hawk, owl and other predators, the cormorant is often seen as a competitor for game, maligned and hated. But like those species, it is part of our natural environment, a native member of our wildlife heritage. It maybe good for fishers that cormorants are eating more gobies but its not good for cormorants. Gobies eat zebra mussels, another invasive species, who are filter feeders. Toxins that build up in these mussels are passed on to gobies. These toxins will then bioaccumulate in cormorants when they eat gobies. As we can’t place our hopes on cormorants decreasing goby populations and because of how completely gobies have spread throughout the Great Lakes, the best we can do is prevent their further spread into tributaries. But the cormorants and gobies are not the only threat to fish in the Great Lakes. There is a disease effecting fish and fishing in many waters in the USA. It’s called Viral hemorrhagic septicemia. The Animal and Plant Health Inspection Service of the USDA has a good website showing how people who boat, nature watch or fish can recognize and help prevent its spread. As you can see they are also sponsoring a photo contest. Anything you can do to help get the word out is much appreciated.